Good morning and thanks for stopping by here at Ink a Doodle Creations. Today I am over at SSINKspiration and we are sharing projects inspired by Pinterest. You know that place online we all just can't get enough of. From Recipes, to color combos, to card sketches and home decorating ideas, one can find just about anything on Pinterest. Its such an inspiring one stop shop. As I was browsing and looking for something to pop out at me, I was a little hungry and look what caught my eye?! 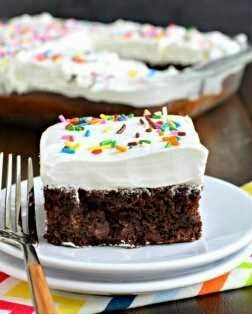 YEPPER, cake with sprinkes!!! 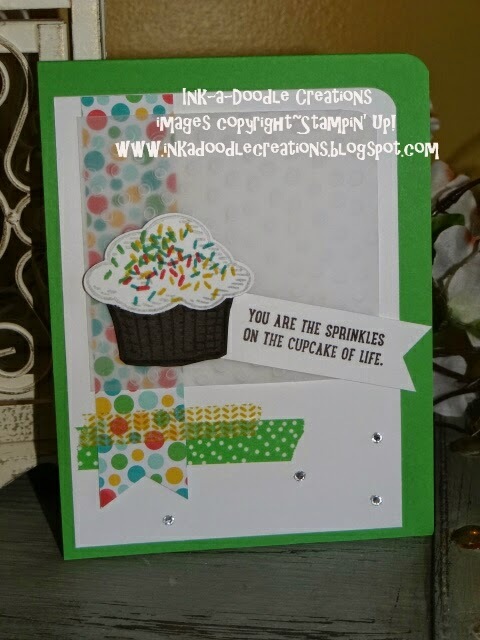 So with cake and the fun colored sprinkles it made me think of cupcakes and one of the all new stamp sets in the upcoming Stampin' Up! 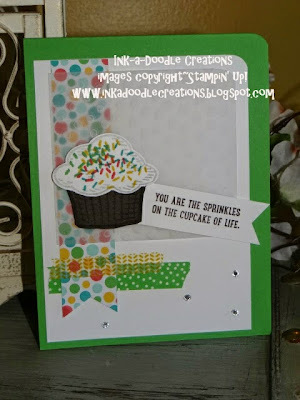 catalog coming June 2, "Sprinkles of Life". I am in love with cupcakes anyway, but now I can create fun ones, with any colored frosting and toppings, but without the calories!!! Now leave some "love" and head on over to see what inspired our other designers! !